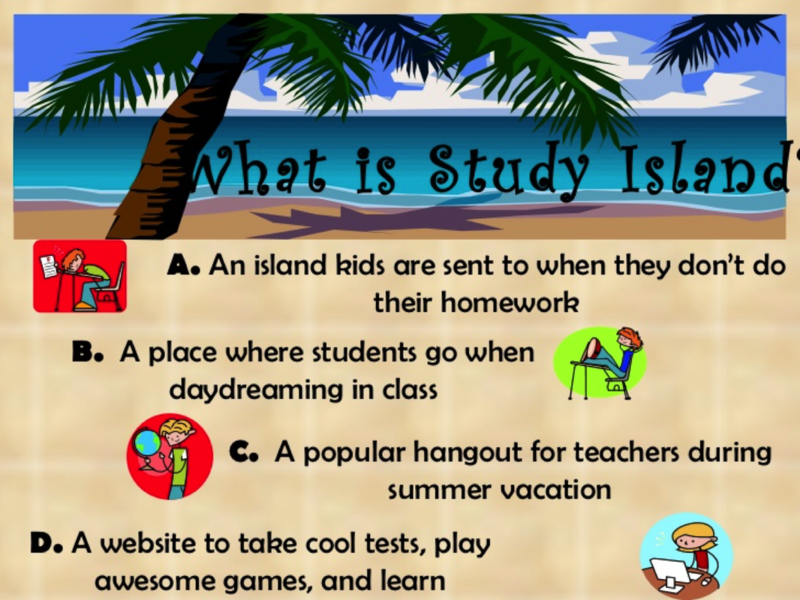 Study Island - Welcome to Mrs. Dudek's Class Page! Study Island is a web-based instructional system that helps K-12 students master grade-level academic standards in a fun and engaging manner. The system is used by more than 10.7 million students in 23,000 schools across the United States, and it offers a comprehensive, standards-based program in math, reading, writing, science, and social studies. Our instructional model and interactive games provide targeted remediation when required, reinforce accomplishments, appeal to students, and generally create a culture of academic success. Study Island is built directly from state standards and the new Common Core State Standards, with crosswalks between the two. It also includes inventive practice activities, formative assessments, and reporting tools to help improve performance. Click Below to Visit the Island! Study Island is completely web-based to allow access the program from any computer with an Internet connection and a standard Web browser. Session results are automatically recorded, including results from sessions completed outside of school. n Every student has his/her own username and password. n The program is divided into sections based on subject. n Each subject is made up of topics, each of which corresponds to specific state standards. n Each topic contains lessons, practice questions, and explanations. n Topics are accompanied by a lesson, which includes information about the material covered by the questions in the topic. n Go to www.studyisland.com, click “Login” on the top right hand side, and enter your username and password. n After signing in on the home page, you’ll have the option to either click on My Class or select a program from the navigation bar to start working in Study Island. n If this is the first time using the program or subject, the student may be required to take a pretest. If there is no pretest option, or if the student has have already taken the Pretest, the student will be able to move on to content topics. n Use the navigation bar on the left-hand side of the screen to access class assignments, reports, high scores, and writing assignments, as well as other sections of the program. nTo pass a topic, a student must satisfy the topic’s passing goal, which is based on a minimum number of questions answered and a minimum percentage correct. A Blue Ribbon is displayed next to all passed topics. n Once a student has passed all of the topics in the subject, he or she will have to pass the post test for the subject. Ignore this step if the subject does not have a posttest. n Log in to Study Island with the login username and password shown above. nClick on My Reports. n Click on a report and select the appropriate grade level.